In fact, Tolkien's novels and stories are a fictional lost history of real, possibly fictional, lost histories. At its heart, Tolkien's Middle-earth hinges on a reworking of the myth of Atlantis. The lost Kingdom of Númenor in the Tolkien books is really a version of Atlantis. Aragorn in the Lord of the Rings is the rightful royal heir to the Kingdom of Men on Middle-earth because he is "last of the Númenóreans." In other words, Aragorn is meant to be one of the fabled Sea People, or People from Beyond the Sea, who are presumed to have been immortal (or near immortal), technologically advanced, beautiful, and magically, physically and psychically gifted. Sometimes they are presumed to have superhuman abilities, like modern superheroes, of flying, super-strength, healing, telepathy and telekinesis. The legend of Atlantis is grounded in speculation about a passage in Plato. Wiki: Atlantis "is a legendary island first mentioned in Plato's dialogues Timaeus and Critias. In Plato's account, Atlantis was a naval power lying 'in front of the Pillars of Hercules' that conquered many parts of Western Europe and Africa 9,000 years before the time of Solon, or approximately 9600 BC. After a failed attempt to invade Athens, Atlantis sank into the ocean 'in a single day and night of misfortune.'" Is there a chance that Atlantis actually symbolized one of the eternal moral and idealized archetypes in Plato's philosophical Theory of Forms? 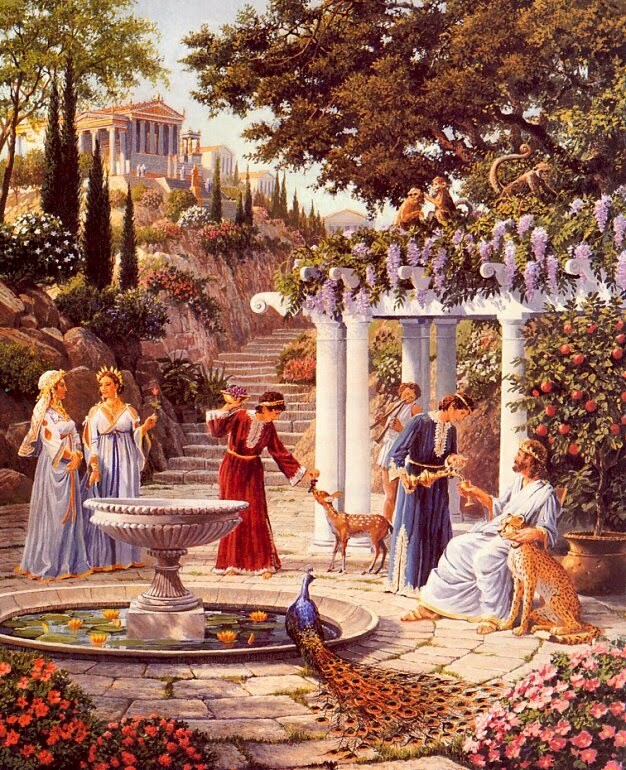 Was this Plato's allegory for the 'ideal form of a society'? - Or was Plato indeed recounting in 360 BCE what he thought was the real history of a long lost island (since believed to have been positioned in the middle of the Atlantic Ocean between North America and Africa)? Atlantis, by Lloyd K. Townsend. 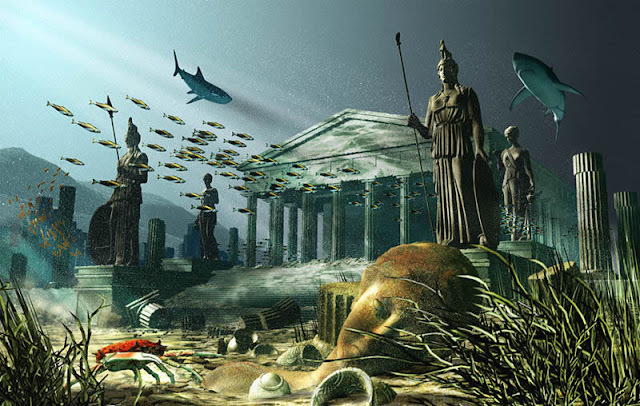 Thus, on the one hand, Atlantis is generally presented as a Greco-Roman civilization (even though it is supposed to have pre-existed those societies by almost 10,000 years) that had somehow attained all the answers to questions that still plague our modern-day existence. Moreover, they had reached our current level of technological development - or perhaps gone beyond it. In a sense, Atlantis represents the Greek ideal that lies buried at the centre of traditional views of Western civilization. It's a perfected cultural memory, a depiction of a soul-searching Western self-conception frozen in time, both primal and hugely advanced, where a beautiful balance between society and technological growth has been achieved (something that has long eluded all human societies). Atlantis might also be a metaphor for the better parts of Western culture that are generally perceived as having been fatefully relinquished or irretrievably lost. On the other hand, Atlantis is ironically additionally presented as a mysterious empire that once truly existed. Because it appears in Plato's works, it is considered by some to be a missing historical fragment, part of the unwritten history of humanity that lies earlier than our written records. Our written accounts are partly limited by tangible historical events, such as the burning of the Royal Library of Alexandria, which was likely accidentally destroyed by Julius Caesar when a fire he started in the port got out of control. Fires also ruined the Eastern Roman Imperial Library of Constantinople, which had preserved the whole body of Greco-Roman knowledge for almost a thousand years. In 473 CE, one fire destroyed 120,000 volumes. Norman Crusaders in the Fourth Crusade burned part of the library in 1204. Finally, it was completely destroyed by the Turks in 1453, although some parts of the collection went to the Sultan's library. The Roman Imperial Library of Constantinople was the last of the surviving great libraries of the Ancient World. Without written accounts, a writer like Tolkien was tracing the Prehistoric history of humanity in oral traditions and by following the historic evolution of ancient languages. When these researches are paired with archaeology and palaeontology we glimpse an early historical fabric that we immediately recognize in the Lord of the Rings. All cultures abound with legendary missing civilizations, islands, lost cities, and secret societies that, even now, pass on our core mysteries to each new generation and tantalize with the possibility that the mysteries may be real. But was a kingdom like Atlantis actually real? In 2009, a similar case popped up when David Grann prominently expanded his 2005 New Yorker article into a book, which proposed that the legendary Lost City of Z had finally been discovered by archaeologist Michael Heckenberger. In the annals of archaeology, this was a huge deal. Yet for those who had a picture of Z that was mythologized, the dimensions of the find were almost too human, too small, less Indiana Jones, more anticlimactic. Tolkien picked up on the Atlantis theme and merged this Greek legacy with later Celtic, Scandinavian, Germanic and Jewish cultural traditions. One particularly important source was the Swedish story that brought together a body of much earlier stories, Hervarar saga ok Heiðreks. Compare these scenes to Theoden's speech in The Two Towers on youtube here. Death of the shieldmaiden Hervor. Painting by Norwegian artist Peter Nicolai Arbo (b.1831-d.1892). Håkon the Good. 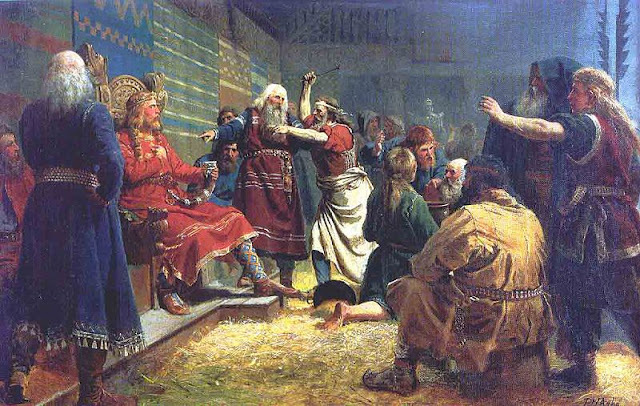 A painting of the third king of Norway by Peter Nicolai Arbo (1860). Similar to religious texts like the Bible, these oral sagas do constitute heavily encrypted and exceedingly distant historical cultural artifacts. But they are so old, and have been told and retold so many times that even by the time they reached written form, plucking out fragments of historical reality from the sea of myth would have been nearly impossible. This was the case with Plato's account of Atlantis. He was describing a kingdom that apparently existed 9,300 years before his time. And he was writing over 2,300 years before our time. Legends are the amalgamated wreckage of histories that lie beyond the boundaries of our certain memory. 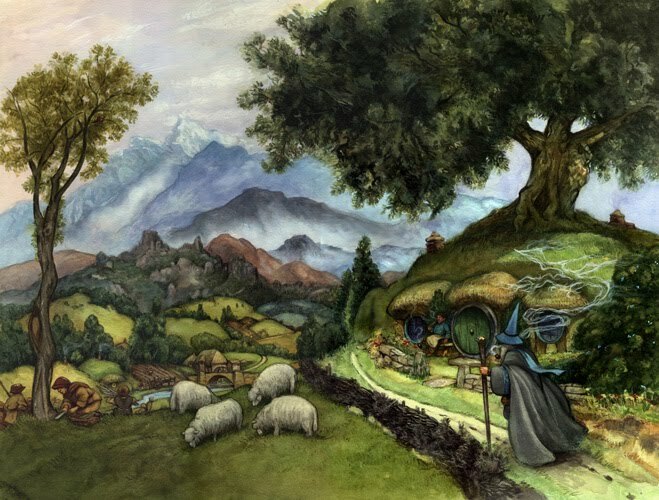 Yet the enormous popularity of Tolkien's works, the way his fantastic reworkings of older cultural forms immediately gripped the modern and postmodern popular imaginations suggests that there is something of the past that we have forgotten - but still know. Conversation with Smaug. By J. R. R. Tolkien. What historical realities can we pick from Tolkien's fantasies? 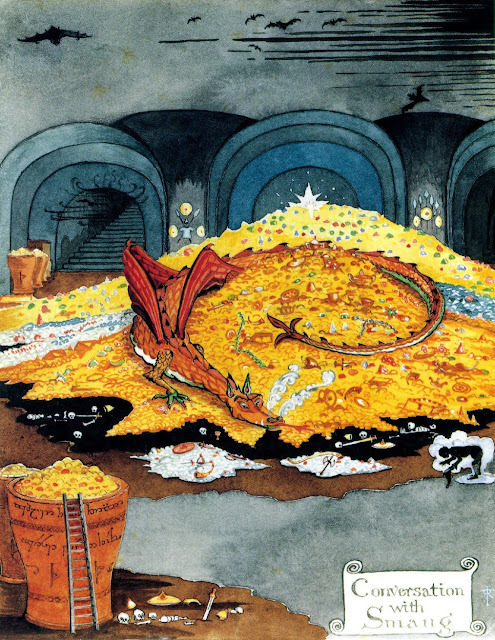 The dragon Smaug in The Hobbit is the last of his kind, living in the Lonely Mountain. Clearly, dragon myths are evidence that ancient peoples found fossils of dinosaurs and built up stories around them. There is a discussion on the links between dragons and dinosaurs here. Dragons are feared creatures in Western mythology and revered in Eastern mythology. Looking forward, there is a telling line in Alien 3, in which one of the characters describes the alien as a dragon. It seems dinosaurs are so primal to our grasp of history and our place in time that when we go out to space, we take them with us. 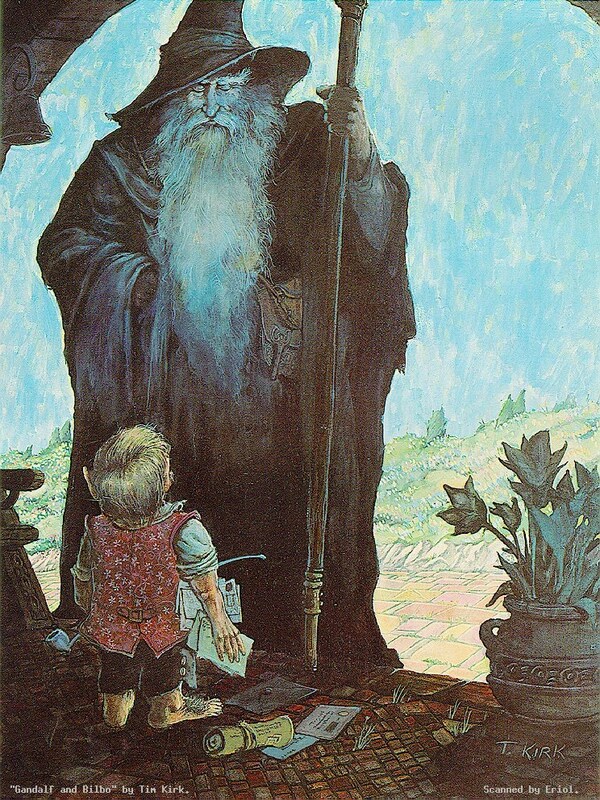 Gandalf and Bilbo by Tim Kirk. The Hobbits and other races. The derived sagas of Middle-earth appear to involve a growing struggle for survival between different hominid species: Men, Elves, Dwarves and Hobbits. 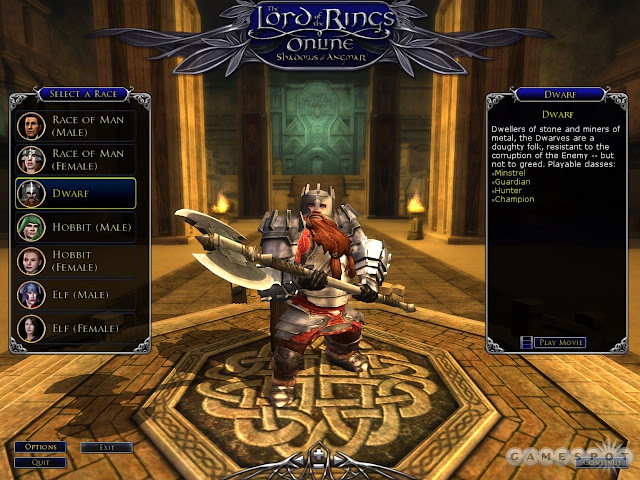 Orcs are derived from Elves, and Wizards may be Men, although they're described as something more like an ancient elemental dieties that take the forms of Men. 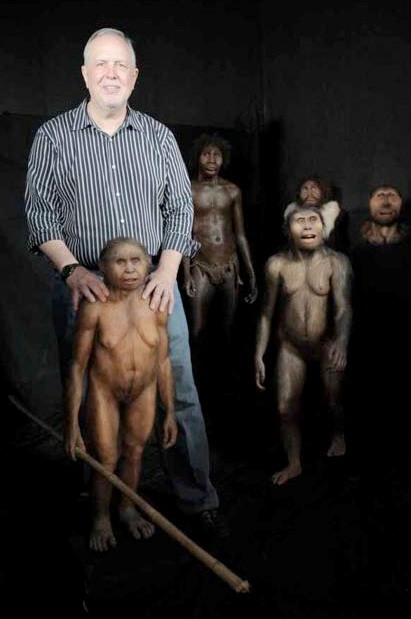 Stony Brook University anthropologist William Jungers with an artist's rendition of Homo floresiensis. Reading between the lines in myths, legends, and Tolkien's modern reworking of that material is like reviewing a catalogue of early human Prehistory. 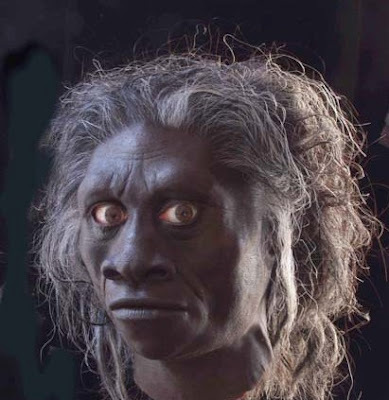 The 2005 discovery of the three-foot tall hominid Homo floresiensis, or 'Flores man,' immediately captured people's attention as a race of hobbits. There are reports on the impact of the Indonesian discovery here and here; this hominid appears to have lived from 97,000 to roughly 13,000 years ago (different sources give different numbers). 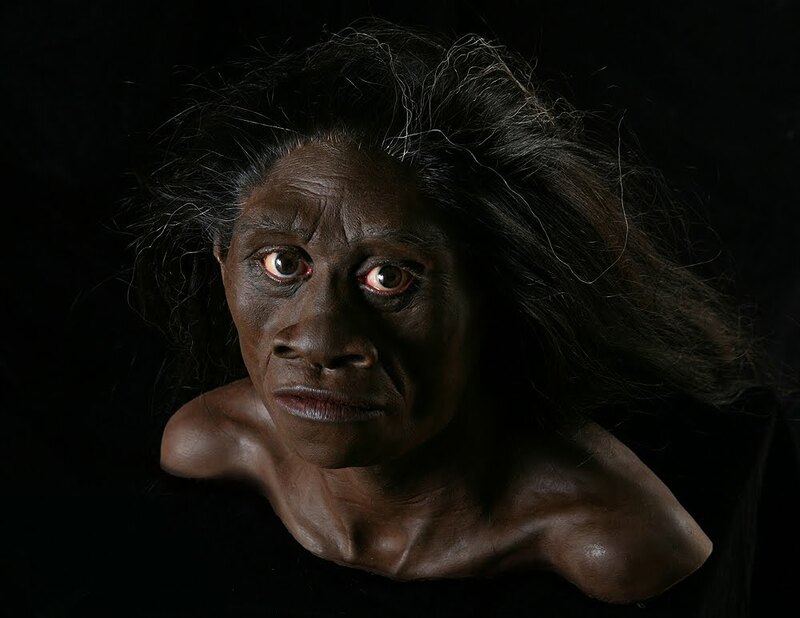 Homo floresiensis by Paleo-Artist John Gurche. Legends of men encountering trolls, gnomes, ogres, giants, goblins or Tolkien's dwarves may reflect the co-existence of two branches of hominids in Europe. 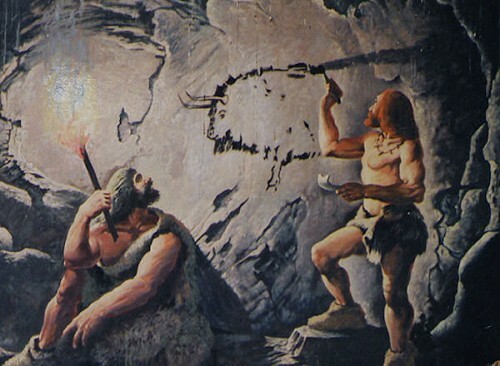 Cro-Magnons (Homo sapiens sapiens), the first early modern humans, were responsible for early cave paintings in France. The earliest appearance of Cro-Magnons is dated in Europe at 35,000 years ago; they were early modern humans, practically identical to us. 'Cro-Magnon' refers to modern human development up to 10,000 years ago - after which members of the species are merely considered modern humans, or Homo sapiens. Recent discoveries of ancient bodies preserved in sphagnum bogs of Northern Europe reveal a later Homo sapiens culture that is very familiar in the Tolkien-esque fantasy world. The oldest body discovered, the Koelbjerg woman, lived 8,000 years ago. These are people whose development spanned the Stone Age to the Iron Age (Mesolithic (Middle Stone Age), Neolithic (New Stone Age), Bronze Age and Iron Age). Their clothing and hairstyles are quite Tolkien-esque. 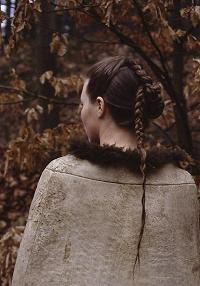 A reconstruction of Denmark's Elling woman's cloak and hairstyle. 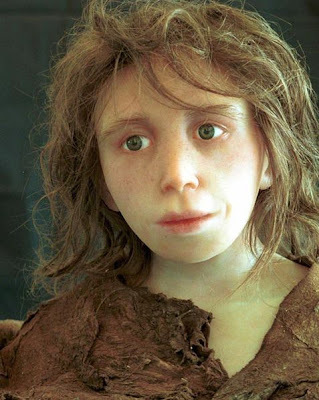 An international exhibition, The Mysterious Bog People, displays some remains and clothing fragments of these Prehistoric Homo sapiens peoples and their cultures. 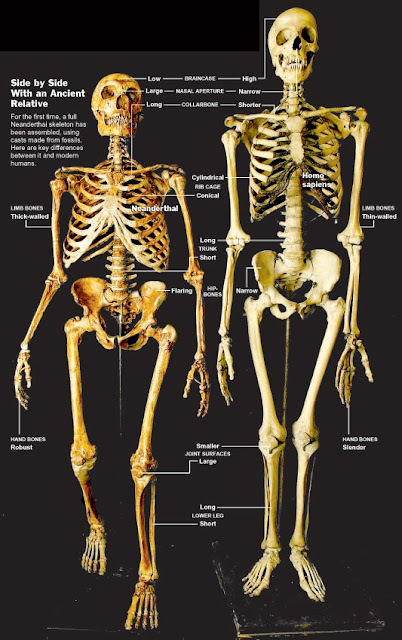 Neanderthal skeletal comparison with modern human. Trolls, dwarves, ogres, giants or goblins - might all be myths about Neanderthals, who were larger and heavier than Cro-Magnons. Neanderthals appeared 600,000–350,000 years ago and had disappeared in Asia by 50,000 years ago and in Europe by about 30,000 years ago - though they may have lived as recently as 24,000 years ago. Homo neanderthalensis by Paleo-Artist John Gurche. From Mathilda's Anthropology Blog: "Neanderthals were very stumpy, and totally lacking in a waist. They also had wider hips, which would have made them pretty slow runners. The consensus now is that they probably didn’t run down their prey (endurance hunting), but attacked them up close with stabbing spears, which would account for the high number of serious injuries they sustained. A reconstruction I saw of a Neanderthal inner ear suggested their sense of balance was a lot less developed than a modern humans. They probably did[n]’t get up to any gymnastics, and were poor runners." Neanderthal child. Constructed by University of Zurich researchers Christoph P.E. Zollikofer, Marcia Ponce de León and Paris-based Paleo-Artist Elisabeth Daynès. Neanderthals were an older species, better adapted to the receding Ice Age. But for roughly 5,000 to 10,000 years during the Middle Paleolithic period, they co-existed uneasily with advancing Cro-Magnons, and interbred with them. Neanderthals retreated into isolated, colder areas, although recent finds suggest they had fairly sophisticated flint blades and tools, until they became extinct; there is a report on their extinction here. This is how I imagine cautionary stories about trolls hiding under bridges or in caves and stealing and eating human children may have come about. 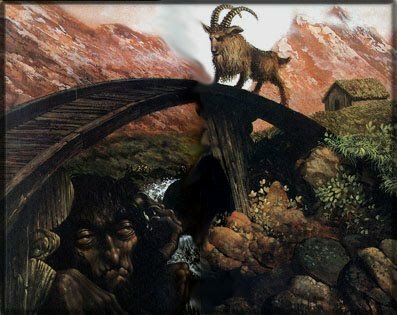 A famous Norwegian fairy tale about a troll under a bridge is Three Billy Goats Gruff. What about elves? 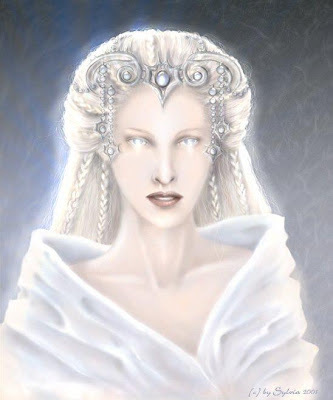 In the Tolkien version they are very close to ancient elemental dieties, yet they are depicted as being able to intermarry with humans and have children with them. They are taller than humans, unimaginably beautiful, refined, immortal, and possess various sophisticated technologies and medicines. They are presented as having a highly complex written culture which is nonetheless linked to the elemental powers of forests, skies, streams and fire. They are not immune to corruption, however, since corrupt elves became the villainous orcs in Tolkien's stories. At the end of the Lord of the Rings, the elves sail off across the sea to Valinor - the Undying or Deathless Lands - that is, they depart to a realm of immortality. The 'sea' in this case may be a metaphor for 'space,' an implication that these are aliens who possess the technology of space travel. They are also in love with the stars - the first things they saw when they awoke into existence at Lake Cuiviénen. At Lake Cuiviénen by Ted Nasmith. The elves of Middle-earth are more the personifications of Tolkien's languages - the ultimate fantastic incarnations of his linguistic researches. Thus, they represent a transitional evolution in which humans shift from communing with the powers of the earth to translating that experience into linguistic communication. They are our higher spiritual and mental capacities personified - which is a more powerful idea than making them boring old space aliens. They are the best of ourselves. Galadriel by Sylvia Polster (2001). When we talk about Tolkien's Middle-earth, we are talking about the temporal span during which recognizable human behaviour existed, but before writing developed. This is the period of Prehistory, which prehistorians divide into three periods according to the development of tools: "The three-age system is the periodization of human prehistory into three consecutive time periods, named for their respective predominant tool-making technologies; the Stone Age, Iron Age, and Bronze Age." That sets Prehistory at the period roughly from 200,000 years ago to 6,000 years ago. But if you are looking for the 'Tolkien Prehistoric era' that is the stuff of fantasy, it probably begins in the period during which Neanderthals died out while interacting with modern humans, at the latest 24,000 years ago, up to the beginning of written history, 6,000 years ago. That's 18,000 years of unrecorded human history! No wonder our historic sense of legends is so overwhelmingly powerful. 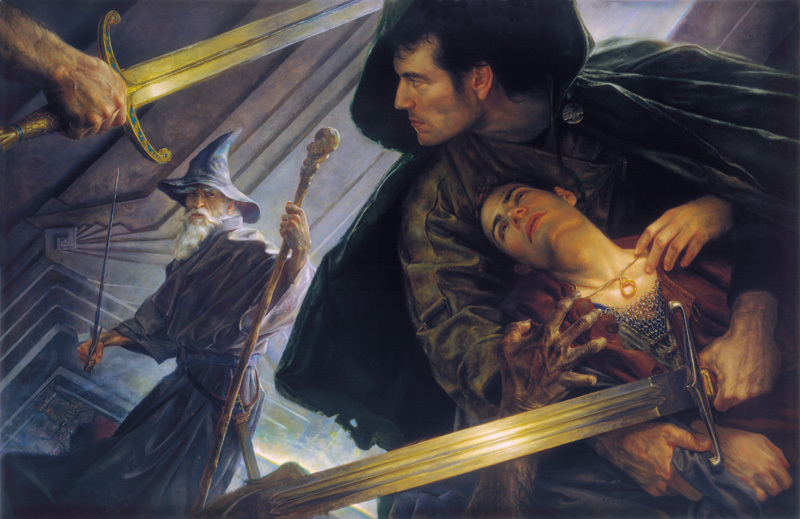 The Lord of the Rings by Donato Giancola (1999). Recorded history began with the invention of written language. Wiki: "By definition, the modern practice of history begins with written records; evidence of human culture without writing is the realm of prehistory." Conventionally, the earliest point of written recorded history started in Ancient Mesopotamia around 4,000 BCE with the Sumerians, and later at 3,400 BCE with the Egyptians, with some older Egyptian glyphs now being discovered. There was possibly an older written tradition in China. Wiki: "There have recently been discoveries of tortoise-shell carvings dating back to c. 6000 BC, but whether or not the carvings are of sufficient complexity to qualify as writing is under debate. If it is deemed to be a written language, writing in China will predate Mesopotamian cuneiform, long acknowledged as the first appearance of writing, by some 2000 years." But we were defined by our weapons and tools first, even before our languages. Of course, that is what the Lord of the Rings is all about - the cataclysmic jump from one form of tangibly-defined human consciousness to another.